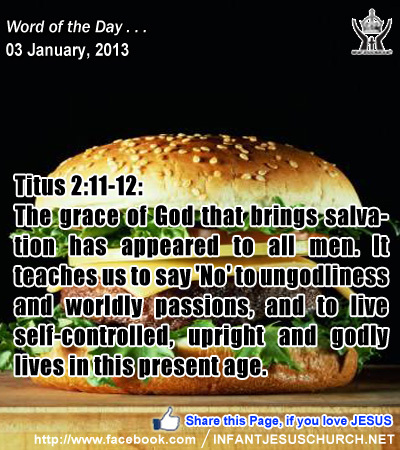 Titus 2:11-12: The grace of God that brings salvation has appeared to all men. It teaches us to say 'No' to ungodliness and worldly passions, and to live self-controlled, upright and godly lives in this present age. Heavenly Father, we confess that we live in a confusing age. Satan is always distorting the difference between right and wrong, good and bad, moral and wicked. Because you have been so gracious with us, may our life today reflect the righteousness you gave us through Jesus. May the words of our mouth and the thoughts of our heart, be pleasing in your sight. Through Infant Jesus, we pray. Amen. 29The next day he saw Jesus coming toward him, and said, "Behold, the Lamb of God, who takes away the sin of the world! 30This is he of whom I said, `After me comes a man who ranks before me, for he was before me.' 31I myself did not know him; but for this I came baptizing with water, that he might be revealed to Israel." 32And John bore witness, "I saw the Spirit descend as a dove from heaven, and it remained on him. 33I myself did not know him; but he who sent me to baptize with water said to me, `He on whom you see the Spirit descend and remain, this is he who baptizes with the Holy Spirit.' 34And I have seen and have borne witness that this is the Son of God." When John says he did not know Jesus he was submitting to the hidden reality of Jesus' divinity. But the Holy Spirit in that hour exposed to John Jesus' true nature, such that John bore witness that this is the Son of God. How can we be sure that Jesus is truly the Christ, the Son of the living God? The Holy Spirit makes the Lord Jesus recognized to us through the gift of faith. God gives us his Spirit as our helper and direct who opens our hearts and minds to obtain and understand the great mystery and plan of God - to unite all things in his Son, our Lord Jesus. Do we want to grow in the information and love of Jesus Christ? Ask the Lord to pour his Holy Spirit upon us to get deeper our faith, hope, and love for God and for the plan he has for our life. Loving Infant Jesus, fill us with the power of your Holy Spirit and let us grow in the knowledge of your immense love and truth. Let your Spirit be burning in our heart that we may know and love you more fervently and strive to do your will in all things.